So we had a slow down. I’ve not been happy with myself lately, been a little ill too! However I’m collecting my thoughts and getting back into the swing of things. Sometimes being sick makes you think about things…and clarify your thoughts. 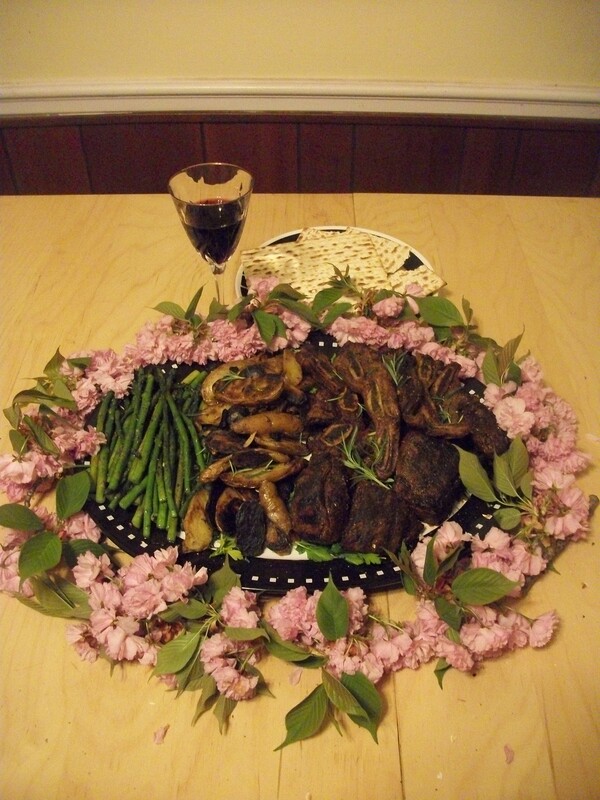 So….after the matzah, the grilled asparagus, and purple, white and rose fingerlings and beef ribs and wine came the driest Pesahdik chocolate cake ever.! Ugh…I used to like those things-even if they did come from a box! Passover always energizes me. Spring is my birth season and Passover is a spring festival that celebrates liberation, personal change, going from slavery to freedom, and the emerging out of the old. Even more so, it honors rebirth and a fresh start. So here I am, starting over from scratch. The beauty of most world faiths and paths, is that they allow us to revise, repent and renew. What we see in nature, we see in ourselves. After a while to reflect and re-consider (Yeah I know…re, re, re…) I’ve decided to further clarify what this blog and my forthcoming site, www.michaelwtwitty.com are all about. Taking a cue from my favorite holiday; I want to base the direction of things on a new set of questions I’ve spent the past few weeks thinking about. In Hebrew-speak, the Four Questions are not known as the arba (four) she’elot, but the arba ha-kushyot—a Talmudic term from Aramaic, meaning “difficulty,” “contradiction,”) just as in Hebrew, “kasheh” means “hard” or “difficult.” So yeah they are “questions,” even as they are “difficulties.” To connect it to the theme of Pesach/Passover, it is our questions and difficulties that often enslave us, while the answer, the response, the resolution, sets us free. It often goes unnoticed that the Hebrew word for “repentence,” is “t’shuva” which is also the same root term for the word corresponding to the English word, “answer.” So now we’re full circle…I’ve not been tending this garden, and I want to make up for it and I want to give the world some new responses, new answers to play with. So here we are. I have seven difficulties.. Some of you may find it strange that I use a Jewish intellectual vehicle on a decidedly Afrocentric leaning blog and project. I’ve come to realize that there is great strength in just being yourself. DEFINITION 1. Does African and African Diaspora cooking and African American cooking have a world class cuisine status? I’ve always believed it but what does that really mean? What are the elements? ART 2. What makes our cooking an art? Who are its artists? How do they learn their art? How can their art be passed on? Can it be artisanal? KNOWLEDGE 3. What is our food knowledge? Knowledge is not the same as “mind.” This is the body of learning it takes to know this tradition, to execute it in the form of sourcing, preparing, cooking and serving it…and knowing its history, provenance and the import of its legacy. MIND 4. Does this family of food have a “mind?” Where does it find its rules, values, principles, design, logic? What are the thought processes involved? PLACE 5. Does this food have a place? Does it have the quality of terroir? Are their heartlands? What are the resources that make for great Black cooking? How do we define its sense of place across oceans, lands, time, space? AESHETICS 6. What is the aesthetic of our foods—colors, sounds, textures, presentations, flavors, etc.? Can we attach this aesthetic to other aesthetic principles in the wider cultural tradition? OWNERSHIP 7. Is this tradition something that its community of creators can own? Is this a form of traditional knowledge that aligns with other forms of knowledge that demand a sense of legitimate provenance, creation and authenticity? So I have a lot of work cut out for me….